When entertaining family and friends, whether it is for a traditional holiday or something as casual as a get-together to watch a football bowl game, dips are always a great idea. 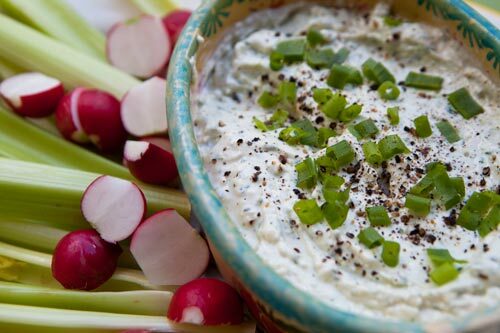 Most dips need to be prepared ahead of time, and in fact improve in flavor with advanced preparation, so dips are usually great choices for entertaining. Adding healthy items served along with a low fat dip to scoop it up such as raw veggies, or whole wheat pita chips also helps to keep dips a healthy snack option and adds some nutritional value to the snack. 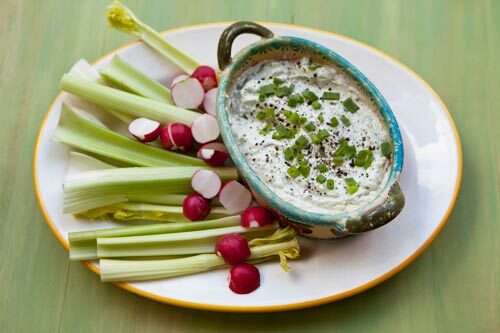 If you are planning a Superbowl party, this dip is also great served along with baked chicken wings or chicken fingers. This recipe was adapted from one in Southern Living magazine and uses the lower fat versions of such high fat ingredients as mayonnaise and cream cheese. Blue cheese has such a strong flavor that a little goes a long way in this recipe! Using the reduced fat versions of cream cheese and mayonnaise decreases calories from fat substantially. Serving raw vegetables and whole grain pita chips along with the dip to increase nutritional value. Fat free Greek yogurt was used in place of the sour cream included in the original recipe to improve the nutritional profile. A lower fat version of a traditional blue cheese dip that sacrifices none of the flavor. Adapted from Southern Living magazine January, 2011. Place all the dip ingredients into a blender except the blue cheese and pulse until blended. Taste and adjust flavorings as needed. Scoop the dip into a serving bowl and stir in the blue cheese, mixing well. Garnish the top with some additional blue cheese crumbles and chopped green onions. Serve with fresh veggies, and whole grain pita chips. I am reading this website regularly and I love your approach to food. I’m Dutch and I’m curious about other cultures and their food/recipes. I’ve made this gingerbread cake and it turned out alright but I have a question for you. I never used molasses before and to me it taste and smells like licorice! (we Dutch like our licorice or “drop” as we call it but as candy not in a cake). The taste of the cake for us (my family) is overpowered by the taste of molasses. I like the light structure of the cake and its moistness and want to make it again only with half the amount of molasses. Do I need to substitute the other half with an other ingredient for the balance in the recipe? And what would you recommend to substitute it with? I’m looking forward to read your answer. You could use honey in place of some of the molasses. thank you! I’ll give it try.